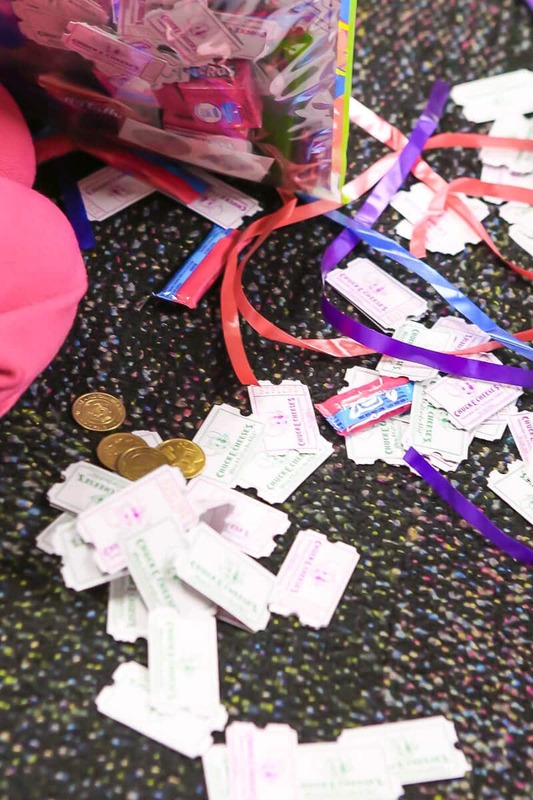 Make life easier for everyone by throwing a Chuck E Cheese birthday party. 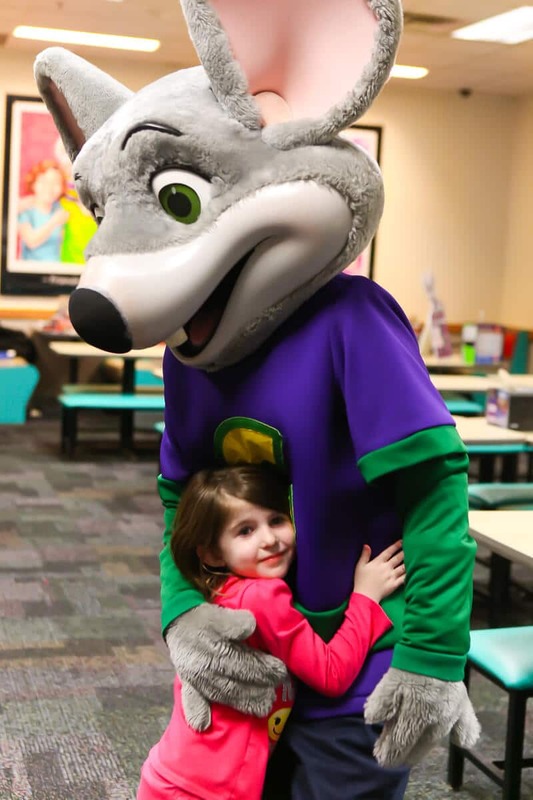 Let my experience with Chuck E. Cheese guide you in planning the perfect Chuck E. Cheese party. Everything you need to know from Chuck E. Cheese prices to what options you have for Chuck E Cheese birthday packages! This post was originally written in partnership with Chuck E Cheese back in January 2017. All information has been updated current to 2019. All opinions are 100% honest and my own! Why A Chuck E Cheese Birthday Party? 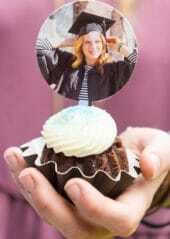 One of the hardest things about not living near my family is not being there for all the special occasions – the concerts, the games, the graduations, and the birthdays. Since we won’t all be together again until who knows when, over Christmas break we decided to have a little Chuck E. Cheese party for my son K, so he would get the chance to celebrate with his cousins for once. It’s been a long time since I’ve either had or been to a Chuck E. Cheese birthday party, but this one was way better than the ones I remember growing up. 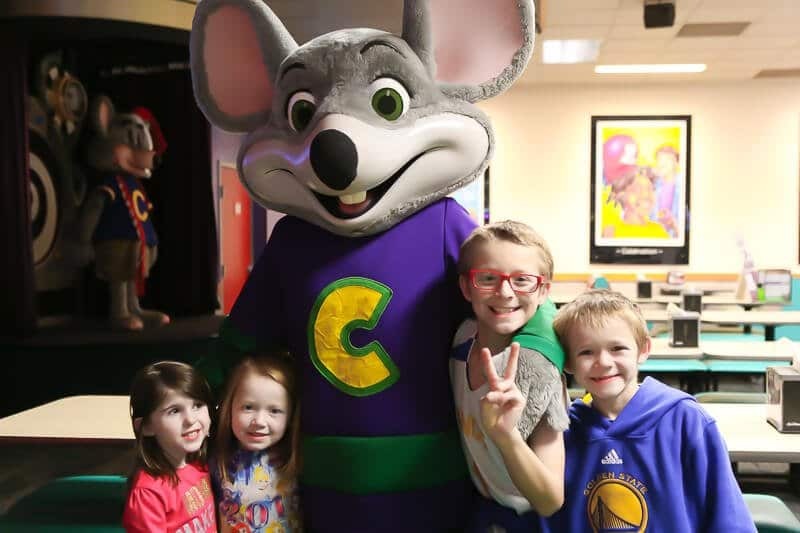 I can definitely see why Chuck E. Cheese is now America’s #1 place for birthday parties – it’s a one-stop shop for fun with food, activities, and entertainment all covered in one of the Chuck E Cheese birthday packages! We had both kids and adults, and I can confidently say everyone had a great time! 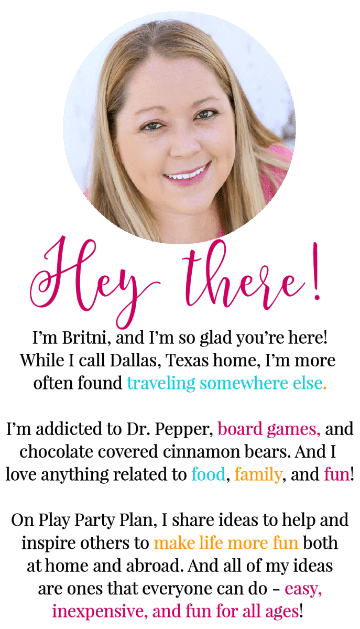 I’ve planned a few more parties at Chuck E Cheese since the first one, and I’m excited to share my tips and tricks for hosting the ultimate Chuck E Cheese birthday party! I’ve broken this guide into various sections so feel free to click through to the section you want to know most about. Or better yet, read them all! Which of the Chuck E Cheese Party Packages is the Best? Let’s start with the most important question – how much does a Chuck E Cheese birthday cost? It depends on how many kids you’re inviting since everything is done per child. It depends on which of the three Chuck E Cheese birthday packages you choose. And it depends on what add-ons you buy (food or other things). Here a quick breakdown of cost if you were to have 10 kids at the party and 4 adults (no additional charge) and wanted to use Chuck E Cheese for pretty much everything. With the extra adults, I’ve also added on the following to the package price, no other add-ons. Here’s what each of these packages would run you based on the calculations above. 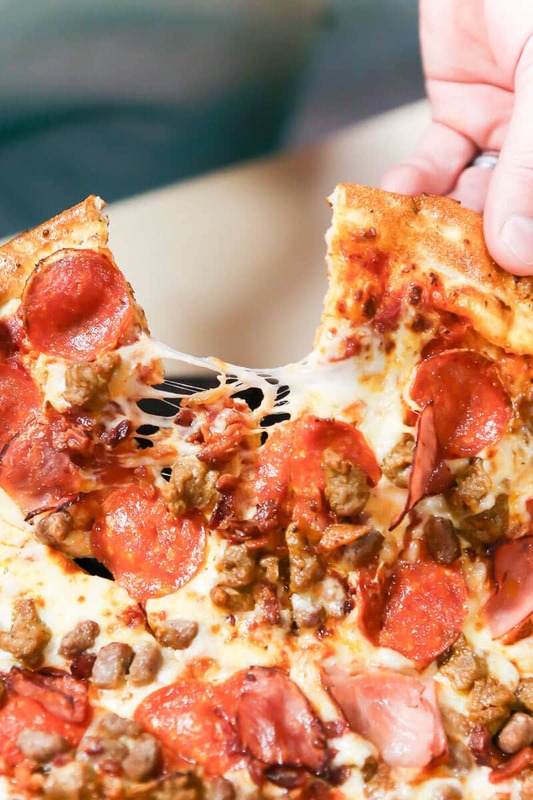 While Chuck E Cheese doesn’t normally offer specific Chuck E Cheese birthday coupons, that doesn’t mean you can’t use regular coupons to buy extras once you’re there. Each store has their own set of coupons available regularly so check out your local store page to see what coupons are available for your party day! Also, be sure to look online when you’re making your Chuck E Cheese reservation because some days offer you special bonus play points! And you might get extra play points for booking online. 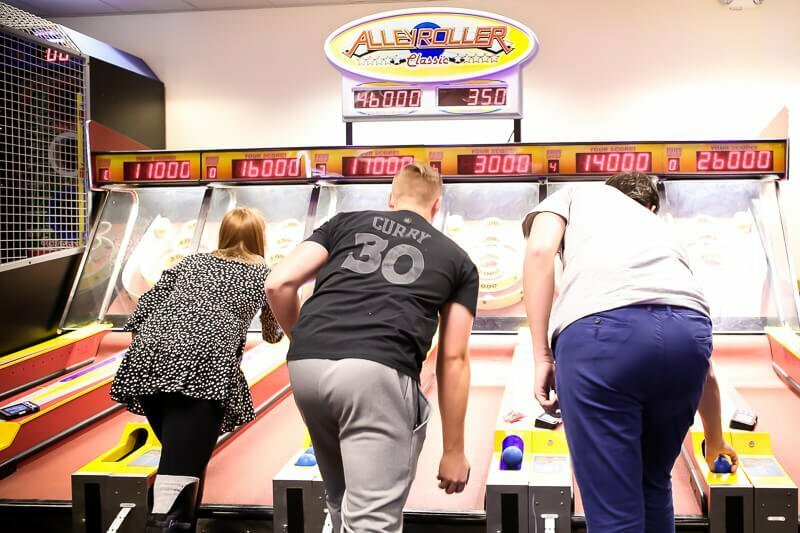 Chuck E. Cheese currently offers three different birthday packages – Star, Super Star, and Mega Super Star – with different options and perks for each package (find the full comparison list and Chuck E Cheese prices here). Here’s a quick rundown of the current offerings for each of the Chuck E Cheese party packages but make sure to click on the link to get exact details just in case they make any updates! 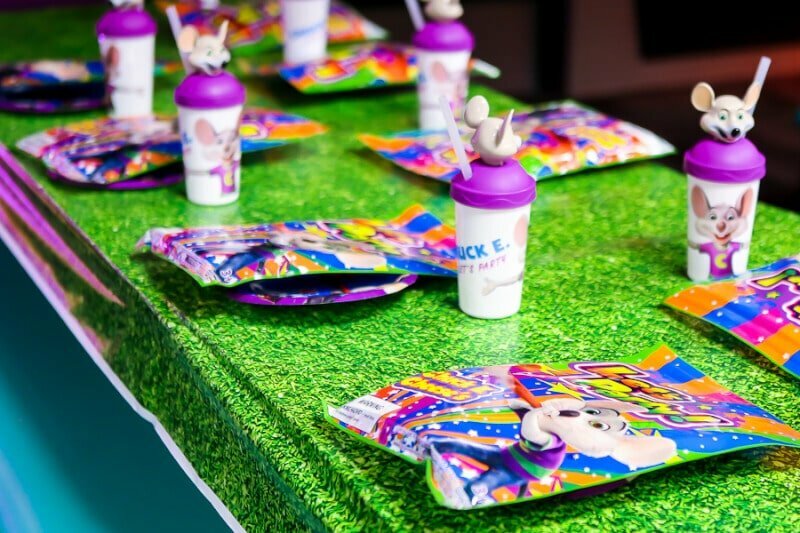 If you want to go with one of the cheaper packages, you can purchase some of the upgraded items like collectible cups, goody bag, and unlimited play package for an additional fee per child. So if you wanted to do the Star package with unlimited play, it’d just be an extra $7 per child but at that point, it’s only saving you $3/child to not do the Mega Super Star so I’d just cough it up and for it. Which of the Chuck E Cheese Party Packages is Best? For us, getting the Mega Super Star package for the kids was a no-brainer. 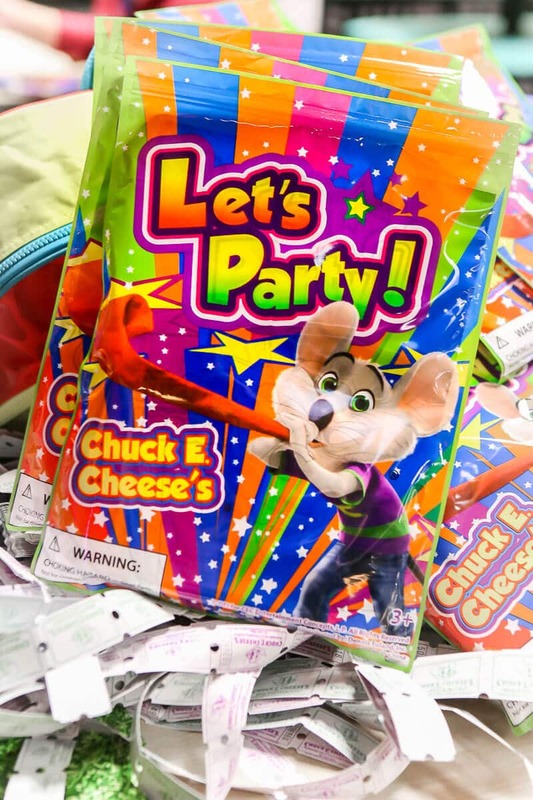 In addition to all of the standard things the other party packages come with (pizza, drinks, dedicated party space, and tokens), the Mega Super Star also included Chuck E Cheese party favors for each child, Dippin’ Dots ice cream, and a 1000 ticket Chuck E Cheese coupon for the birthday child! Make sure to put the bonus tickets in a safe place, we totally lost ours before it was time to turn them all in. But the real seller for us on the Mega Super Star package is the all you can play option. Some kids burn turn through play points so fast that having unlimited play was amazing. At the end of the day if you look at my pricing above, going up each tier is going to cost you an extra $50 for every 10 kids. If you can swing it, the Mega Super Star Package gives you way more for your buck than the Star or even the Super Star package. But if you don’t care about the collectible cup, goody bag, or Dippin’ Dots or unlimited play then by all means go for one of the lower packages. When we got to Chuck E Cheese, they had the party space all set up and ready to go. 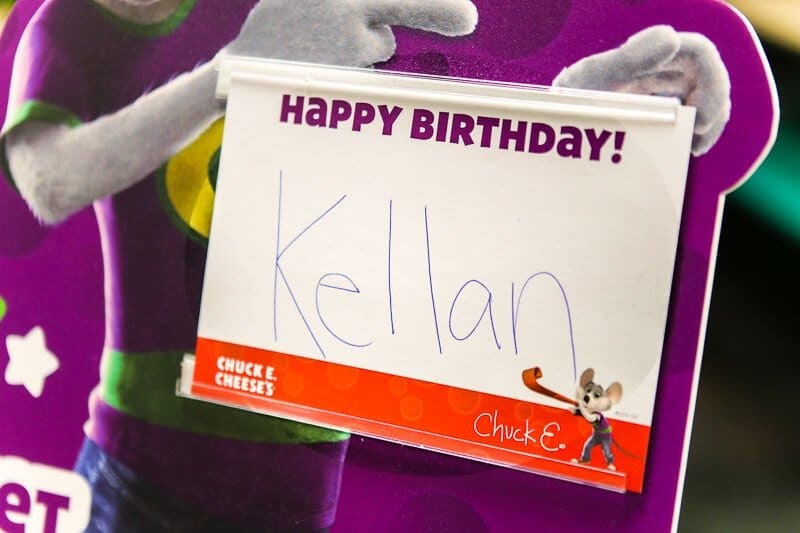 My son was so excited to see his name on the sign, and the kids were all excited about their Chuck E Cheese collectible cups and their Chuck E Cheese party favors – full of treats, tickets, tokens, and toys! 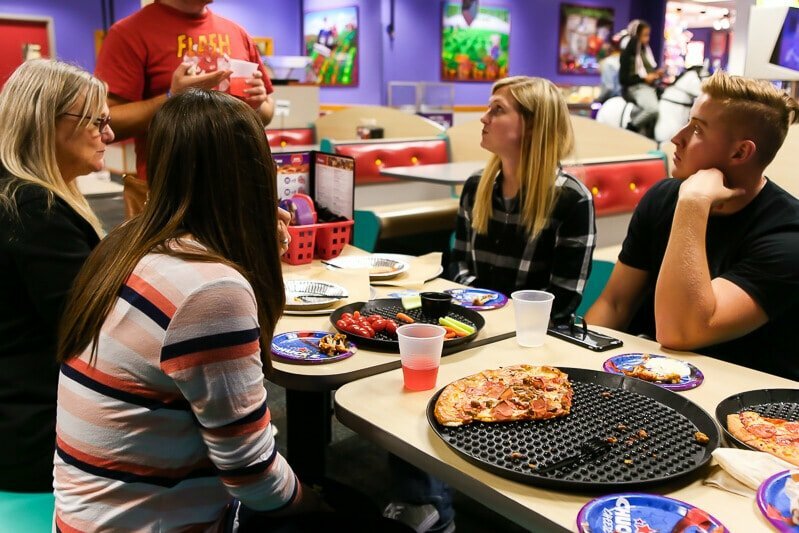 Every kid gets two pieces of pizza included with any of Chuck E Cheese birthday party packages, but if you’re like us and have adults or older siblings coming as well, I definitely recommend ordering some more things off the main Chuck E Cheese Menu as well. While the menu doesn’t have a ton of variety, they do have a bit of something for everyone – including individually packaged gluten free pizzas that my sister-in-law and her gluten-free family really appreciated. It’s one of the few places I’ve seen where they literally cook the pizza inside the sealed package, so there’s no possibility of cross-contamination. The only downside was they only had gluten-free cheese pizzas available and only in a personal size. We went with the traditional pizza, wings, and a veggie platter to round out our comfort food extravaganza. The kids all loved eating at their own special table and two pieces of pizza each was enough to keep them going for playing all the Chuck E Cheese games! 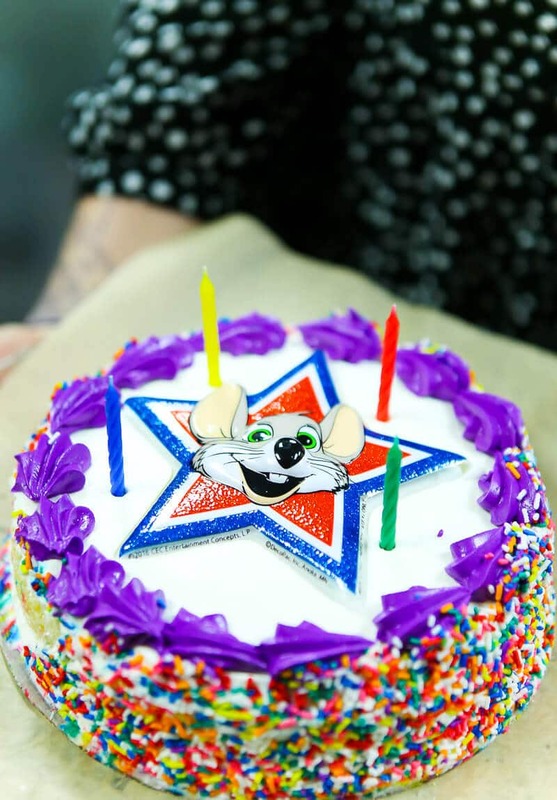 What About a Chuck E Cheese Cake? Chuck E Cheese also offers a bunch of different Chuck E Cheese cake options as well as other themed options like Barbie, Hello Kitty and Batman. We bought one of the 8″ round cakes (serves 12) but if you’re doing a party with lots of kids and adults, I’d go with their 1/4 sheet cake option that serves 18-20. 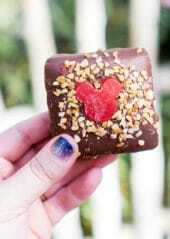 You can get a cake in vanilla or chocolate as well vanilla or ice cream to go with it! Or bring in your own cake if you’d prefer, although I’m all for keeping it easy and ordering a Chuck E Cheese cake was easy. Chuck E Cheese isn’t just for the kids! With fun games, different food items, and free WiFi, the parents and adults that came to our party had just as much fun as the kids. Well, maybe not quite but almost. And there was definitely an epic battle of who could beat my little brother in Skeeball. It was not me. Another nice perk to inviting parents is having other adults to help you keep an eye on the kids. Chuck E Cheese does an awesome kid safe check where you get stamped at the door with your kids and then those kids can’t leave without their corresponding adult. It definitely makes me feel better to know that some random person can’t walk out with my son if I happen turn my back for one second. 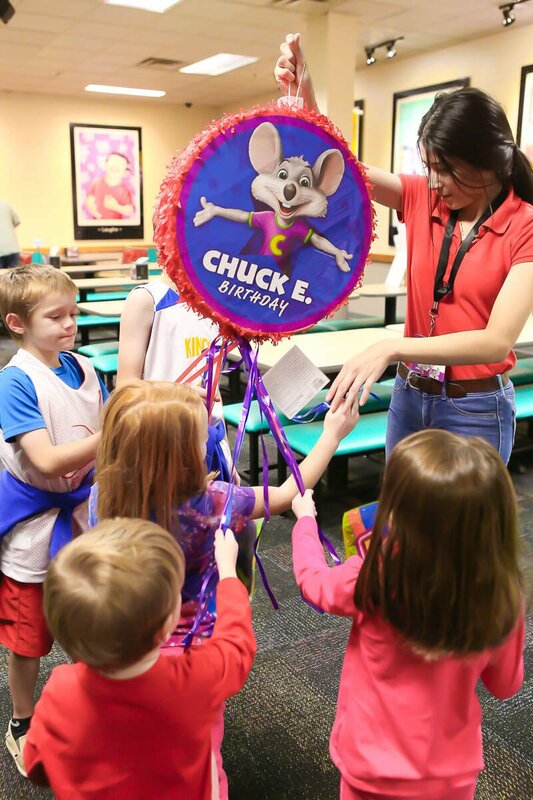 Ready to Book Your Chuck E Cheese Birthday Party? One of the best things about planning our party was being able to book it online. I hate making phone calls, and we were doing it at one of the Chuck E Cheese locations that’s not nearby, so going in wasn’t an option. The new system lets you select your package, how many people, your additional food or add-ons, and an available time/date all online. 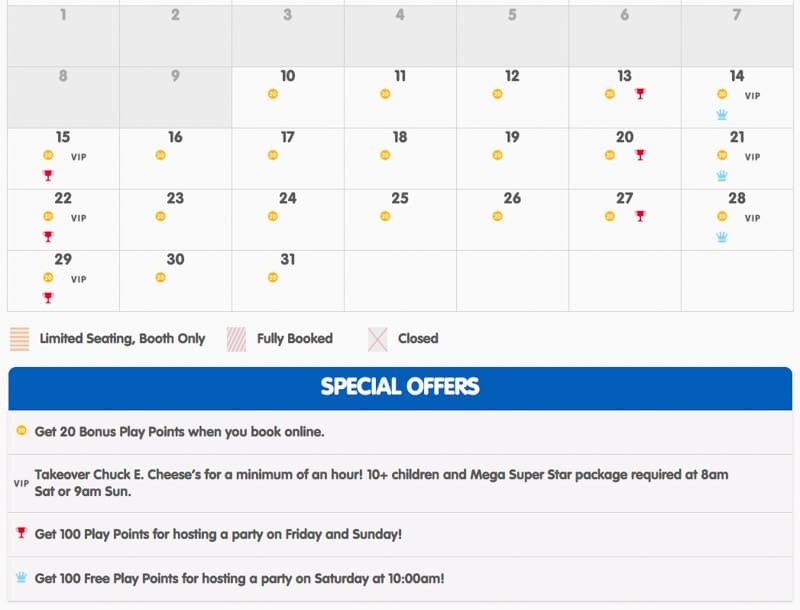 It’s seriously so simple – just go to ChuckECheese.com to book up to 90 days in advance but seriously who knows when they’re having their party that far in advance? You can make changes to lower the number in your reservation up to 24 hors before your party so book the max number you invited then give them the final number a day or two before. If you’d rather have the party space all to yourself, choose the VIP option when you’re booking your party, and you can get in before the restaurant’s normal open hours! 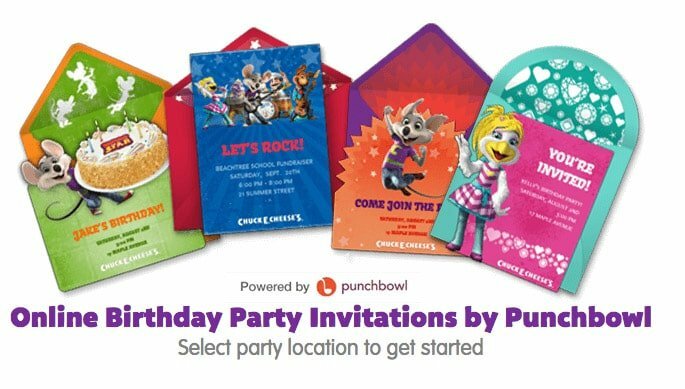 Because Chuck E Cheese likes to make things easy, they even have an option where you can generate and send (via email) Chuck E Cheese Birthday Party Invitations to all of your invites! Simply go here to create the email invitations. Don’t want to send invitations via email? There’s an option to download invites (and thank you cards!) as well. Chuck E Cheese birthday policy allows for up to two no-shows on the day of your party, with a minimum of 4 paid guests. So if you have issues getting people to RSVP or someone RSVPs and then can’t make it, you’re good for up to two kids. Adults are invited too! You don’t have to pay for adults to come but just know they won’t get any food, drinks, or tokens to play unless you purchase extra with your package! You’re not allowed to bring in any outside food other than ice cream and cake. You are allowed to bring in your own table decorations, paper goods (NOT cups), and goody bags if you want to go with a particular theme. All parties are set with a Chuck E Cheese Super Fan theme. If you want a custom theme, you have to bring the supplies and set it up yourself. I love the green grass table cover. Where do they get it from? I have no idea Megan, but I’m sure you can find something similar on Amazon or Oriental Trading Company! Honestly I don’t remember my camera settings but my Sony A6000 is great in low-light! This was SO informative!! I was wondering about the coupons! Thank you for sharing!!! Hi, Thanks for the sharing your birthday party tips. I just found it at the right time. On August 10 is my baby’s first birthday. I have lots of planning around this. I am also adding your ideas on this planning. Hope so it will be a grand birthday for my baby. That’s so exciting! Hope it goes great! Is Chuck E Cheese pinot free? We have a grandson who has a peanut allergy. I’m not sure on that – I recommend contacting your local Chuck E Cheese to check. 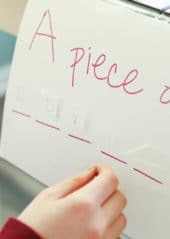 I know you did the unlimited game pass, but for those that don’t pay for that option how many tokens would you say would be good per kid for a hour? How many tokens is each game? At Chuck E Cheese each game is only 1 token but they can go through them pretty quickly. Chuck E Cheese always has deals going on so I would call your local store and see what they can offer you. But I would guess that 15-20 tokens would be good for each kid.